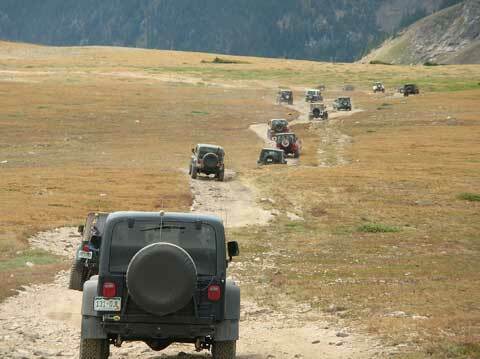 The Trailridge Runners 4WD Club is a group of four wheel drive vehicle enthusiasts who follow the guidelines of Tread Lightly! We are very involved with the public land managing agencies, and act as public lands stewards by doing annual Volunteer projects, including 4WD road maintenance, campground re-constructions, picnic ground cleanups, and signing projects. Since 1990 our club members have put $606,767 worth of volunteer time, skills, materials, and grants on the public lands. We promote the outdoor ethic of cleaning up after ourselves and others while enjoying the outdoors. We work to educate others on the proper use of a 4WD sport utility vehicle by team work and teaching newcomers to the sport of four wheeling. More details about our club can be found on our Information page. The best way to find out more about the Trailridge Runners 4WD Club is to join us at one of our club meetings. They are held once a month, usually the second Wednesday. We meet at 6:30pm for social time, and start the meeting at 7:00pm.